OK. I’ll admit it. 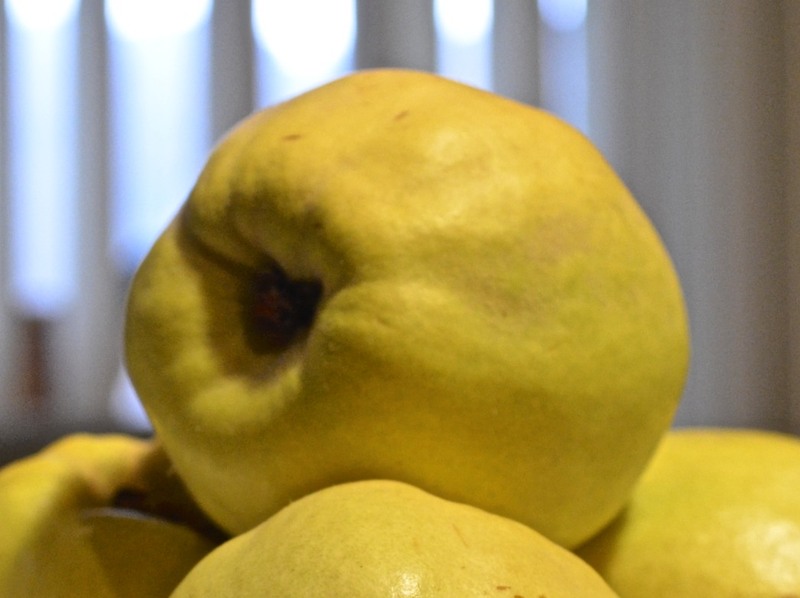 I didn’t know a thing about quince. I certainly didn’t hear about them while growing up, let alone see any of them. When I finally did see one, not all that long ago, I thought it to be a very odd-looking apple — and expensive, at that. Once I purchased the quince, I searched for a recipe. 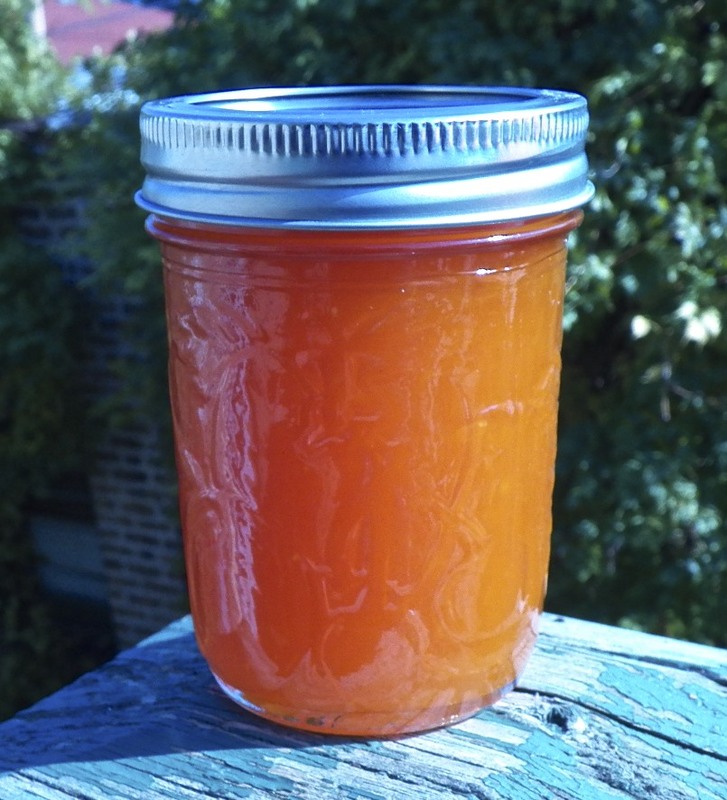 Since quince has a high level of pectin within it, I decided to go without adding any more. This, unfortunately, ruled out Celia’s recipe. (Sorry, Celia.) 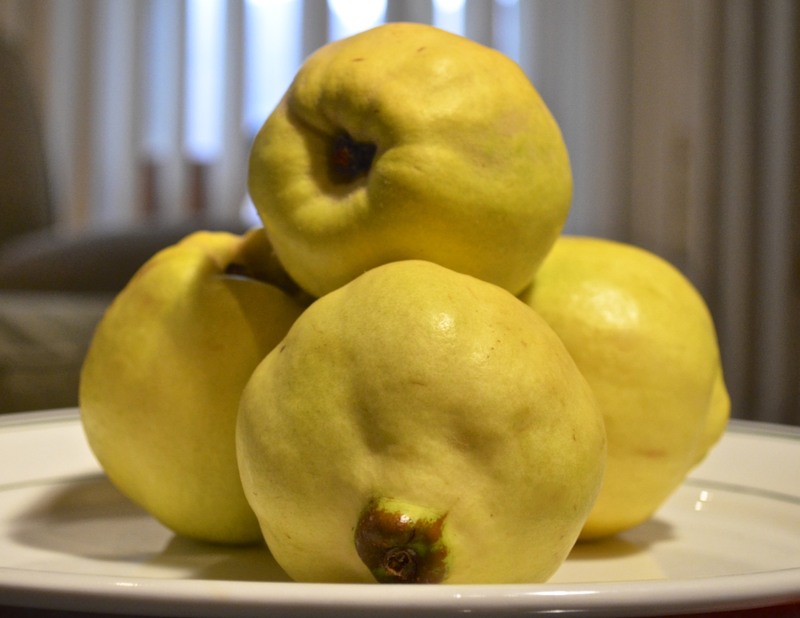 I soon learned that the web is full of quince recipes, all pretty much the same. 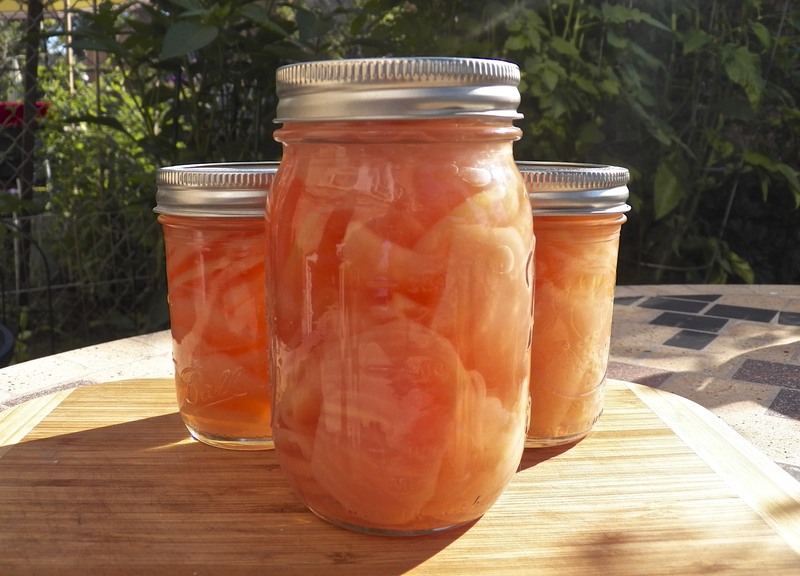 Quince, sugar, lemon juice, and water combine to eventually produce jelly. Well, I like jelly but I prefer jam. Looking a little further, I came upon a recipe that suited my needs. I settled on a Greek recipe for quince jam called Marmalatha Kythoni. Unlike all others, this one had 2 things going for it. Secondly, water used to boil the quince in this recipe may be used to make quince jelly. Granted, you won’t be making a lot but you will get a little over a cup for your efforts. The same ratio (2:1) applies when making jelly, too. The difference being in this case, you use measures and not weight. So, I had 4 cups of quince liquid and used 2 cups of sugar to make a pint of jelly. It could not be easier. The amount of lemon juice to be used is up to you. I like things a little tart, so, I added both lemon juice and zest when making the jam. For the jelly, I used lemon juice only. It’s my “control” and I’ll taste the jelly to determine whether I overdid the lemon when making the jam. Place chopped quince in a large pot with a lid and add enough water to cover (see Notes). Place the lid on the pot and bring to a hard boil over high heat. Reduce to medium heat and continue to simmer for 30 minutes. Keep covered, shut off the heat, and let sit for another 30 minutes. Strain, reserving the liquid for the Quince Jelly Recipe, and place the chunks in a food processor, along with 1/4 cup (60 ml) of water. Process until the quince is the consistency you prefer. Place the now-processed quince in a thick bottomed sauce pan along with the sugar, lemon juice, and lemon zest. Bring to a boil over med-high heat before reducing to medium and simmer, stirring almost constantly to prevent scorching. Continue to simmer and stir until the jam is the consistency you prefer, from 30 to 60 minutes, maybe longer. Place jam in still hot, sterilized jars, place lids and seal — though not quite as tight as you can. Place jars on a rack in a boiling water bath deep enough so that there’s at least 1 inch of water over the top of the tallest jar. When the boil returns, process for 10 minutes. Remove jars from the pot and place on a baking sheet or counter, out of drafts. Be sure to cover the surface with a cloth to prevent the hot jars from shattering when they touch a cold surface. Do not move for at least 12 hours, though 24 is best, to give the jars a chance to seal and the jam to fully set. 4 cups (1000 ml) quince water reserved when making quince jam, recipe above. Place the reserved liquid, sugar, and lemon juice in a medium saucepan over high heat. Use a large spoon to quickly remove any foam before filling the still-hot, sterile jars to 1/4 inch from the top. Follow canning instructions listed in the Quince Jam Recipe above, processing this jelly for 5 minutes in the hot water bath. Store jelly on a cool, dark shelf. 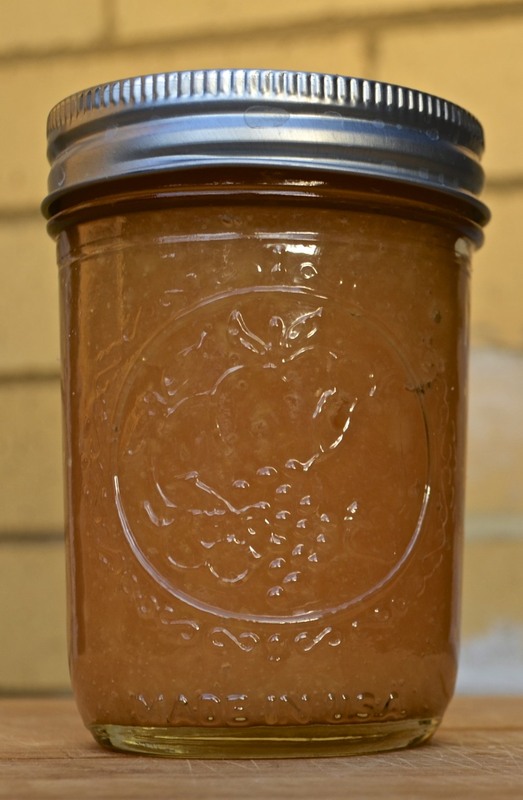 It took 8 quince that, after peeling, coring, and chopping, rendered the 26 oz used in the Jam recipe. 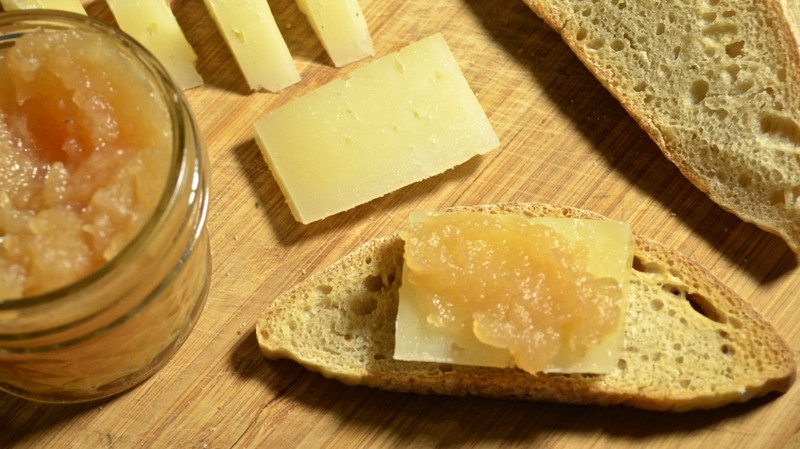 It is best to use ripe quince for this recipe. 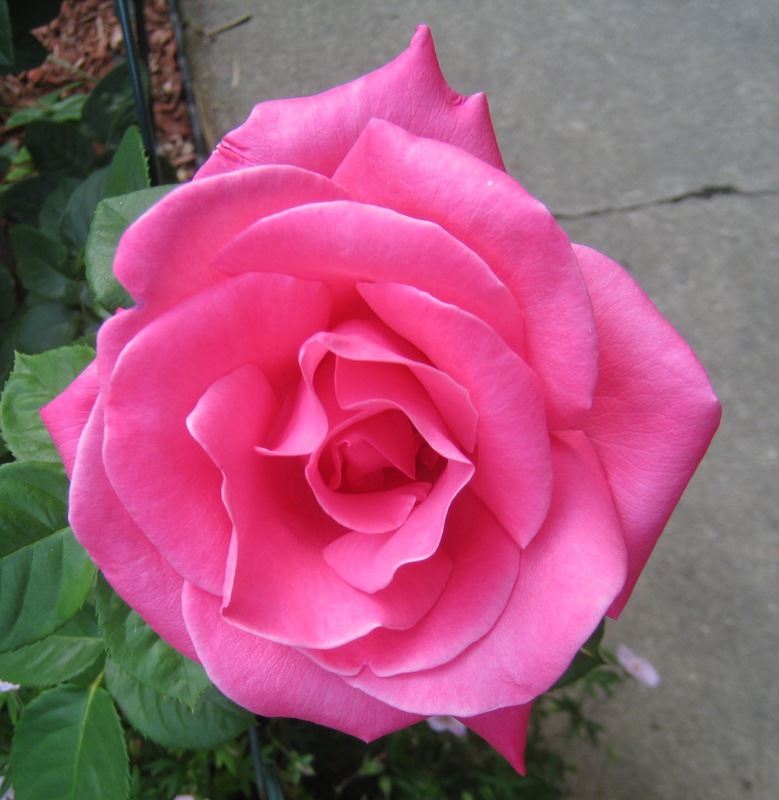 To check for ripeness, sniff either end of the fruit. Ripe quince will have a floral scent. When cut, quince will brown. To prevent this, place the pieces in a large bowl of water. When ready to start cooking the quince, I used this water to cover the pieces in the pot, as indicated in step 1 of the Jam recipe. 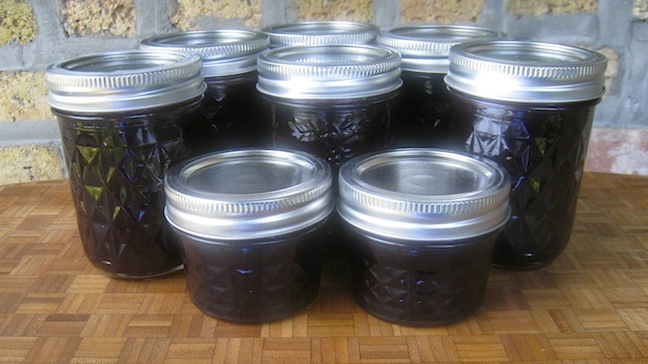 If you plan to make jelly using the cooking liquid, you will need to strain it through a few layers of cheesecloth or, if none is available, muslin or coffee filters will work, too. As you can see in the pictures, my jam is lighter than most. 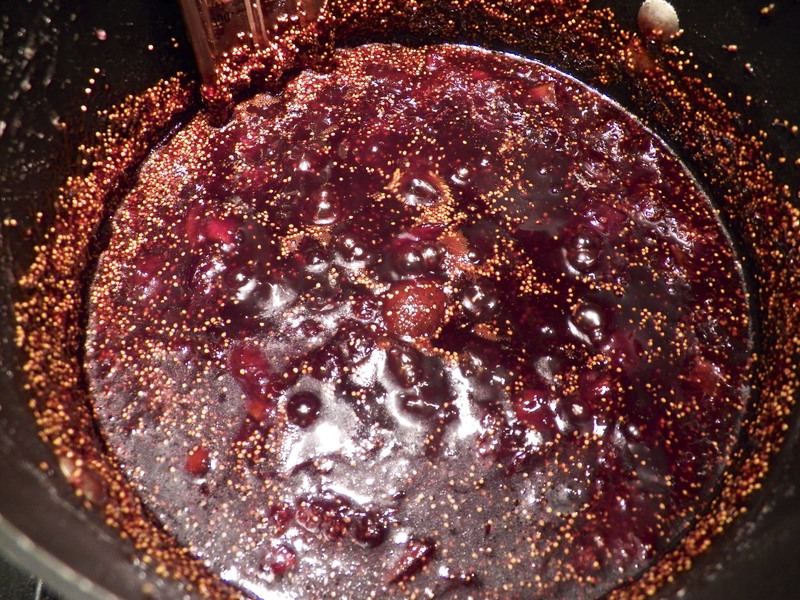 Granted, it darkened a bit as it cooked but never reached the deep color that I associate with quince jam. I was a bit concerned until I compared mine to the photos accompanying the original recipe. In that light, mine is quite similar to the original. Whew! My guess is that this jam recipe doesn’t cook the quince as long as the others, and that deep pink color needs a long cooking time to develop. As it was, my jam was thick enough that I had no choice but to pull it off the heat. With Christmas approaching fast, for the next few weeks I’ll devote this section to some of our favorite holiday recipes. 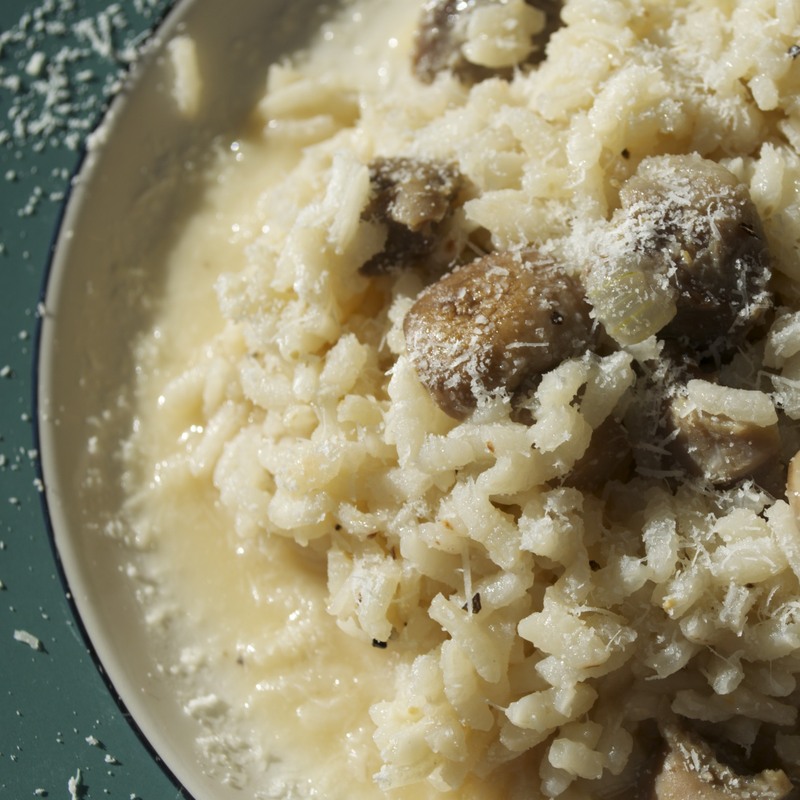 To kick things off, I thought we’d take a look back to our traditional Christmas Eve dish, Baccalà alla Marchigianna. 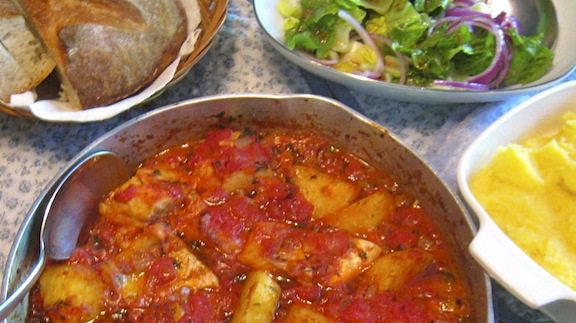 In this preparation baccalà, once rinsed and rehydrated, is cooked in a tomato sauce with potatoes. Serve it with a chunk of bread and you’ll forget all about Santa’s coming in a few hours — well, at least until you’ve cleaned your plate. 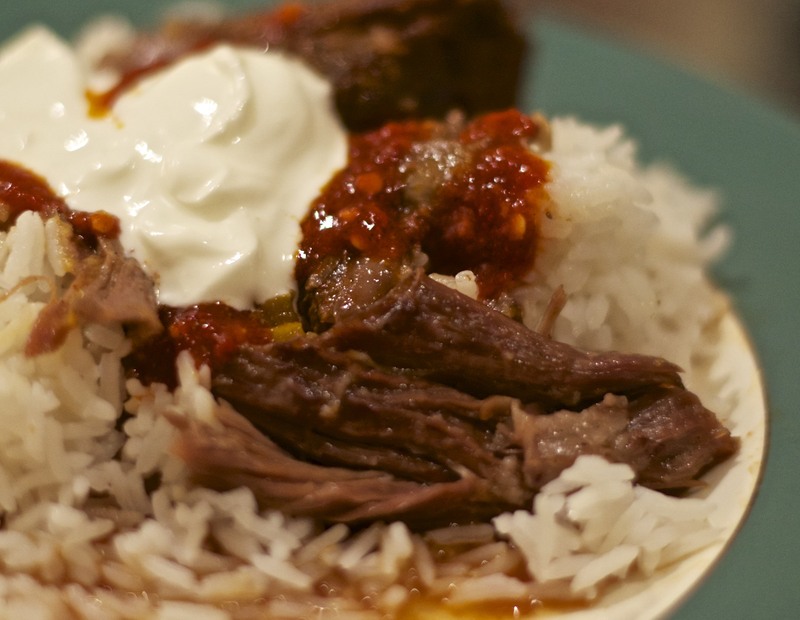 You can learn how to make this flavorful dish just by clicking HERE. My poor Damson plums. Way back in September, I bought 2 overflowing quarts of the diminutive beauties, planning to make and freeze cobblers. Yum, right? Well, this was the Saturday before I was to leave for Michigan and, as luck would have it, there was no time for making cobbler before I left. No problem. I’d bring them to Michigan with me and make cobblers for Zia. The night before I was to leave, I placed the bag of plums on my dining table, along with some of the parts to my ice cream machine. A few hours later, I finished loading the car and left for Michigan. Once there, I realized I had left everything on the table. Poor Zia. She got neither cobbler nor ice cream during my last visit. Upon my return home, as I unpacked the car I passed by that bag of plums a few times. I really wasn’t in any hurry to look inside, figuring it would be an unsightly mess, at best. So, once everything was unpacked, and with my laundry going, I decided to brave the bag and have a peek. Unbelievably, they were pretty much as I had left them. I dumped them into a colander and, though a few were smashed, none were spoilt. I discarded those that were smashed and rinsed the rest. Now, what to do with them? Sadly, the cobbler idea had lost its appeal. Having brought home plenty of apples, there were pies and apple cake (recipe forthcoming) in my future and I just wasn’t interested in making cobbler anymore. (A decision I’m sure to regret this Winter.) That meant my long-neglected plums would be used to make jam. Damson plums are smaller than others and their peel ranges from dark blue to black, some with a hint of deep purple. 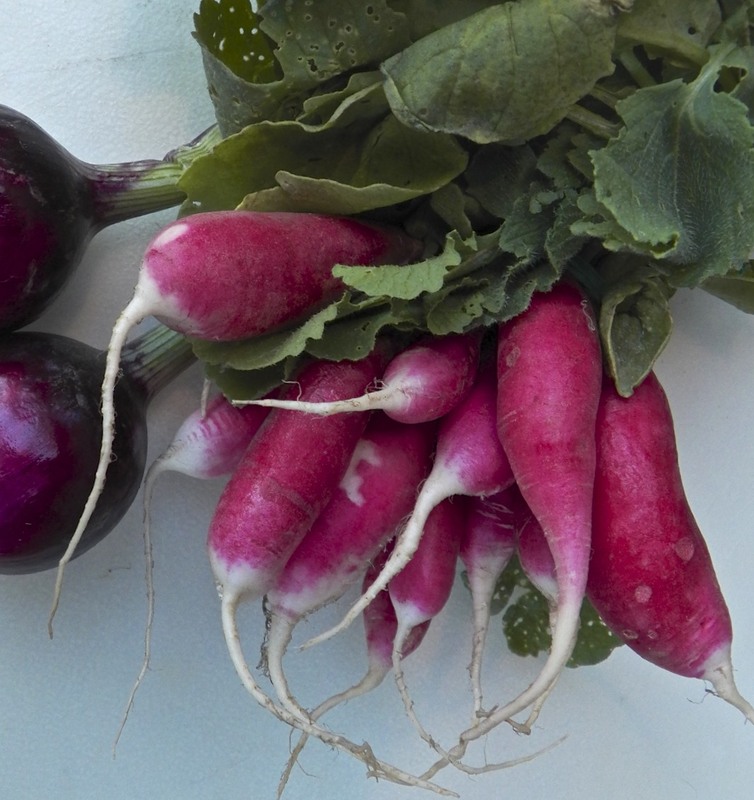 (Sorry, I forgot to photograph them fresh. See? Neglected.) The flesh is greenish-yellow and the pits adhere to that flesh, something you’ll need to consider when using them in a recipe. 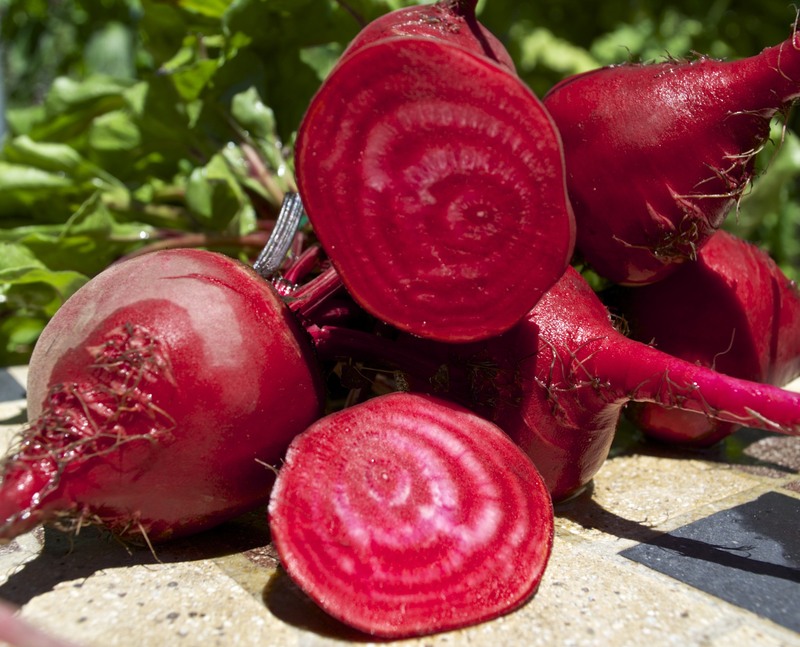 When it comes to taste, the flesh is somewhat sweet while the skin is a bit tart. For me, this makes Damson plums perfect for jam. Use a little sugar for a tart jam, more for a sweeter taste. 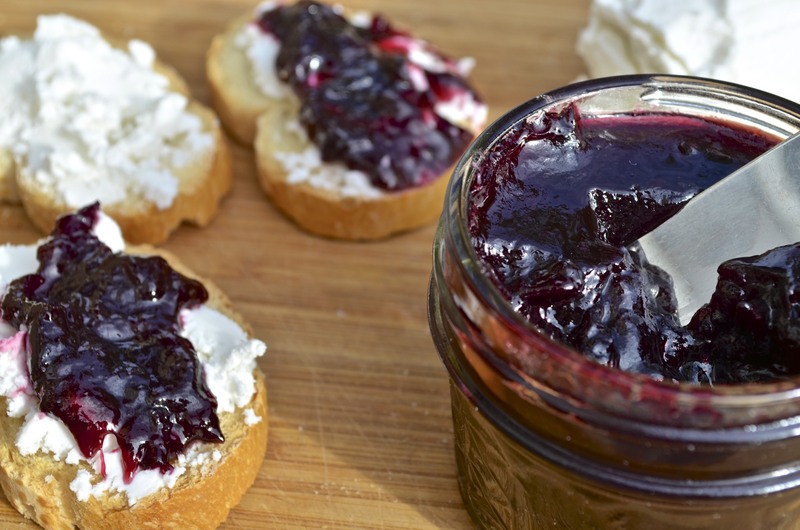 Today’s recipe is a basic jam and no pectin is required. The only questionable part is the addition of the cardamom pods. If you want, you can just toss them into the pot and fish them out of the plums when you remove the pits. Personally, I don’t like that method. It’s far too likely for one to slip past me and, guaranteed, it will be in a jar that I give to a friend or family member. I much prefer to tie the pods in cheesecloth before placing them in the pot. Depending upon how much cardamom flavor you like, the pod package can be put back into the pot after the plum pits have been removed, an option not available if your use the pods alone. Other than the use of the cardamom pods, you’ll find the recipe to be straight-forward. Rinse the plums, removing any stems in the process. Place the plums, cardamom pods, and water in a thick-bottomed pot over medium-high heat and bring to a boil. Reduce heat to low and simmer for about an hour. Remove from heat and allow to cool to touch. Using your hands, squeeze each plum to remove the pit. Discard the pits as well as all the cardamom pods. Reserve everything else. Alternately, a food mill may be used to remove the pits and pods. Place the broken down plums back into the thick-bottomed pot. Add sugar, salt, and cook over medium to med-high heat until a temperature of 320˚ F (160˚ C) is reached. Test to see if jam is ready (See Notes). If your plums are jamming, place in sterile jars and seal. They may be refrigerated and will keep for about a month. They may be frozen and will keep up to a year. Once thawed, use within 3 weeks. If preserved/canned (see Notes), jam will keep up to a year if stored in a cool, dark place. Once opened, use within a month. Serve as you would your favorite jam and may be used to flavor roasts, particularly pork. According to a number of sites, 5 cardamom pods would equal about 3/4 tsp of ground cardamom. I have not prepared this jam using ground cardamom, so, I’ve no idea whether it will have a stronger taste. Though there are a few methods of testing to see if your fruit is jammin’, I prefer to use the plate test. While the fruit/berries are boiling on the stove top, place a dish in your freezer. When you think the jam is ready, take about a half-teaspoon of jam and place it on the now chilled plate. Allow the jam to rest a few minutes before using another spoon or your fingertip to see if the jam has set or is still too runny. If the latter, continue to simmer the jam while returning the plate to the freezer to await the next test. 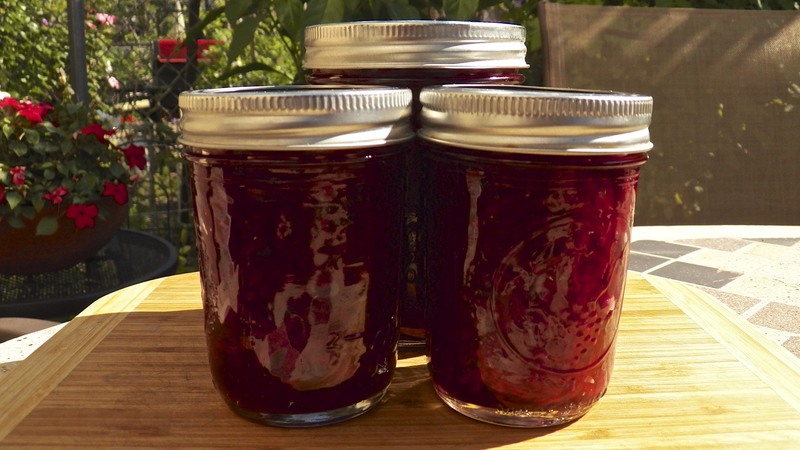 Canning this jam is simple and not unlike other jams & jellies. Once the jam is ready, fill the sterilized jars, leaving 1/2 inch head space. 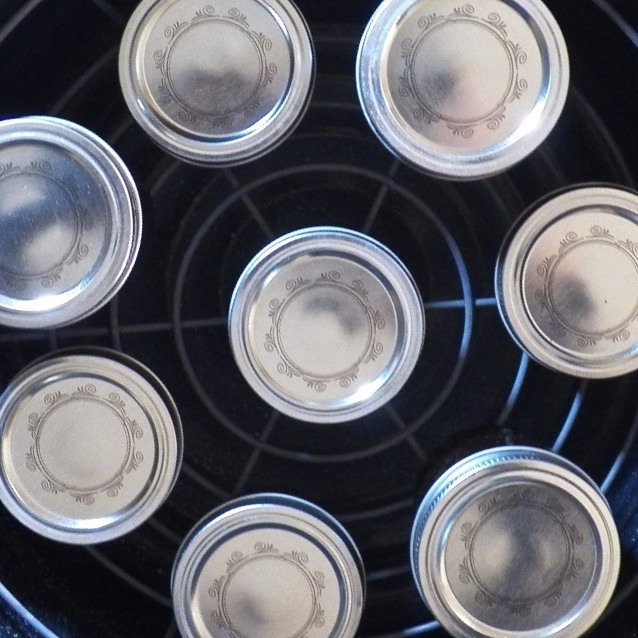 Place lids on top of each jar, tightening until not quite as tight as possible. (I tighten mine fully and then unscrew the lid slightly.) Place each jar on a rack in a large pot of boiling water. Jars must not sit directly on the kettle bottom. Once the pot returns to the boil, begin timing. This jam will need to be processed (boiled) for 10 minutes, if using half-pint or smaller jars (235 ml or smaller). After 10 minutes, remove jars to a cloth-covered counter or baking sheet, away from any drafts. Do not move for at least 12 hours — 24 hours is best — so that the jars fully seal and the jam sets. 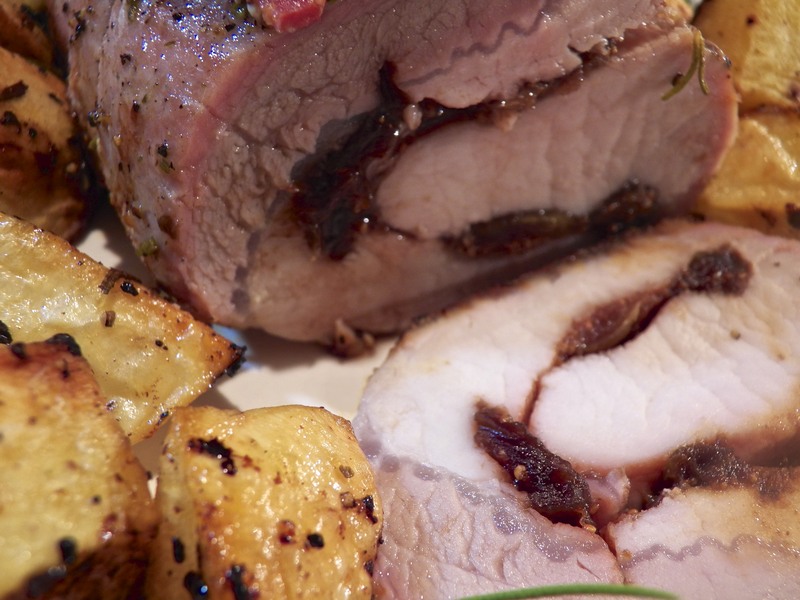 When our temperatures start to drop, I begin to think of preparing roasts for dinner. The oven brings welcome warmth to the kitchen and my house soon fills with the heavenly aroma of a roast in that oven. 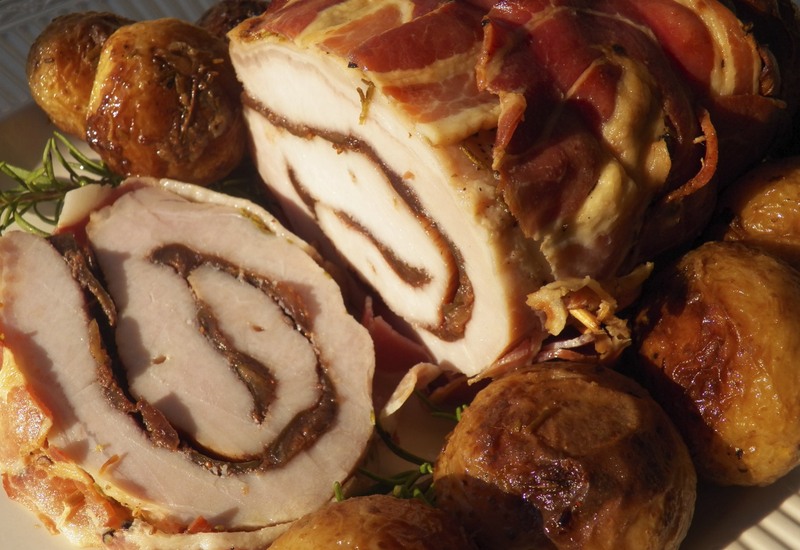 About a year ago, I posted a recipe for roast loin of pork that was butterflied, slathered with fig preserves and wrapped in pancetta before roasting. The result was a dinner fit for a holiday. 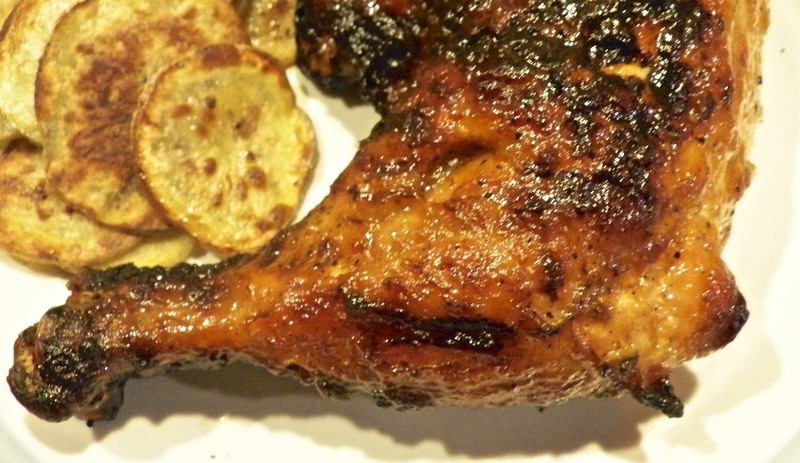 You can see the recipe, along with step-by-step instructions, by clicking HERE. Grandpa was well-known throughout our neighborhood and he could often be seen strolling about, his hands behind his back, with his right hand holding the index and middle fingers of his left hand. The little boy across the street took note and would often mimic Grandpa as they walked together or on opposite sides of the street. For Grandpa, this was the highest form of flattery. He did more than just stroll about, however. If he heard the rumble of heavy equipment or the whir of power tools, he would be at the job site or backyard within minutes. Having once owned a contracting company, Grandpa knew and understood quite a bit about building and repair work. It wouldn’t be long before he’d be advising the worker(s) and oftentimes he’d pitch in, showing them how whatever it was should be done. His opinion was respected and very often sought out by our neighbors and the parish. For example, the front of our church was a massive, floor-to-ceiling mosaic depicting a number of saints and religious symbols. As the church settled, a large crack began to appear in the center of the mosaic at its base, stretching upward like some leafless tree. Grandpa was called in to repair the crack and to replace the tiny colored tiles. Not long after that, following a lightning strike, Grandpa’s knowledge of masonry was required to help with the repairs to the school. As I said, Grandpa was well-known and respected. 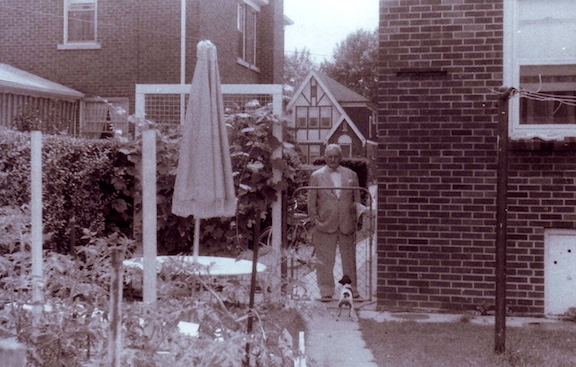 Well, once the heavier garden work — the tilling, fertilizing, and planting — was done for the season and with no repair projects to tackle, Grandpa had time to relax. You could often find him sipping a beer while resting in his hammock under the grape arbor, listening to George Kell announce the play-by-play for the games of his beloved baseball team, the Detroit Tigers. 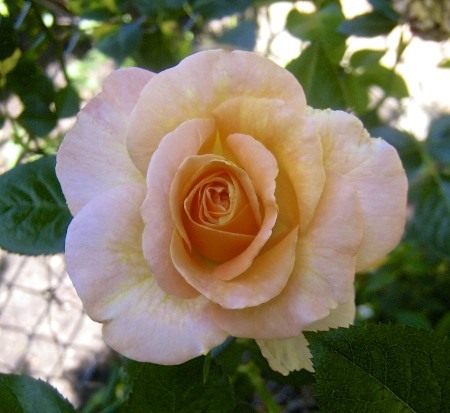 Sometimes he watered the garden from the hammock, using a sprinkler to get those places beyond his reach. Eventually the game would end and that was cause for concern for some of the wives in the neighborhood, for Grandpa would go for a walk. It didn’t matter who you were — neighbor, passer-by, parish priest, mail carrier, etc. 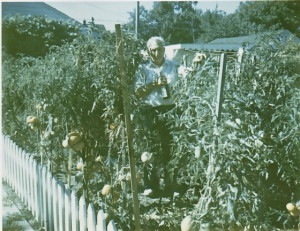 — if Grandpa saw you, he would strike up a conversation and, at just the right moment, invite you to “see my tomatoes.” Within minutes, there you were, looking at his 2 dozen tomato plants, tied to their hockey sticks in neat little rows. He’d show you the brick barbecue, his very much prized Chinese pheasants, the lettuce patch, the grape vines, the potted lemon tree, and his latest attempt at growing a fig tree. Within minutes you’d be invited into the patio and he’d have a cold one in front of you before your rear end settled into your chair. What’s this? You don’t like beer? Not to worry. There was a jug of red wine under the table. Oh? You prefer white wine? There just so happened to be a jug of white wine next to the red. Well, that first beer or glass of wine led to another and another and then another. Somewhere along the line, shot glasses would appear and whiskey was introduced into the conversation. Although the length of these backyard tours varied, they usually ended in the same way, with his guest leaving the yard, though quite a bit more wobbly than when the tour first began. In fact, there were a few times when one of us kids was asked to walk his guest home. These visits did not go unnoticed by the wives in the neighborhood and a few men refused Grandpa’s subsequent invitations. Others would accept but leave abruptly after the first beer. Of course, there were a couple who, for whatever reason, accepted the invitation with no apparent qualms at all. It was after one such visit that a neighbor approached Mom, angry because her husband had ignored her wishes and had returned home moments before, more wobbly than usual. I don’t recall whether she wanted Mom to control Grandpa, her husband, or both but Mom, recognizing a no win situation, did nothing of the kind, The husband, perhaps wisely, kept his distance and I don’t recall ever seeing him in the backyard again. 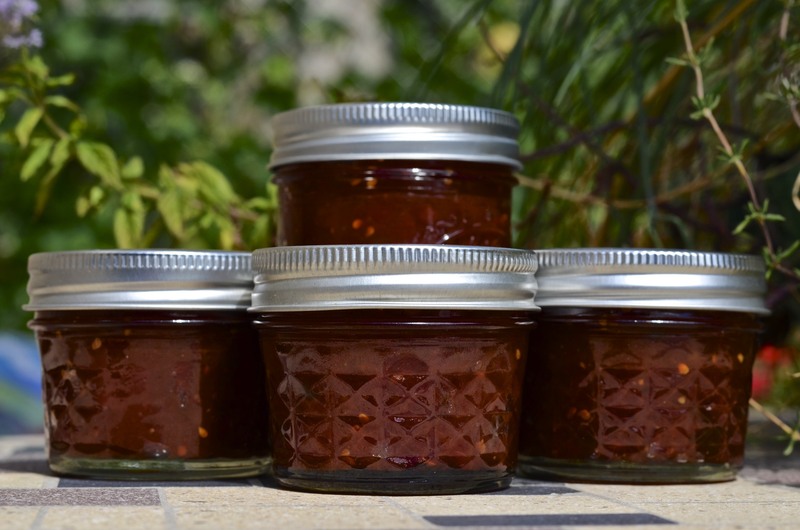 I first became aware of tomato jam last year through my blogging friend, Marie, when she posted a link to a recipe for tomato jam that used Sungold cherry tomatoes. When I mentioned it to Zia, she remembered that Grandma had made tomato jam when both she and Mom were little girls. The way I saw it, I had little choice but to make a batch, which I enjoyed very much. This year, my tomato plants did much better than they have in recent years but the weather was far from cooperative. Though Summer started quite warmly, the sun and high temperatures soon departed, not to return until late August. Up until that time, my tomatoes grew but never got the sun and heat needed to ripen. Then, as September started, so did the ripening and soon I had more tomatoes than I could handle. That’s when I decided to revisit tomato jam, making two batches within days of each other. Unlike last year, however, my tomatoes weren’t Sungolds. In the first batch, I used only heirloom plum tomatoes. 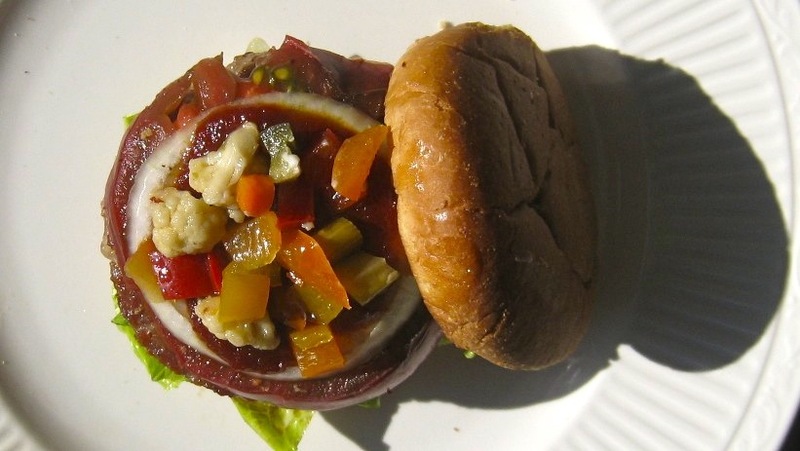 In the second, I used an even mix of tiny cherry tomatoes and more heirloom plum tomatoes. Since my tomatoes weren’t as sweet as Sungolds, I referenced Mark Bittman’s recipe for tomato jam, as well as the one suggested by Marie. 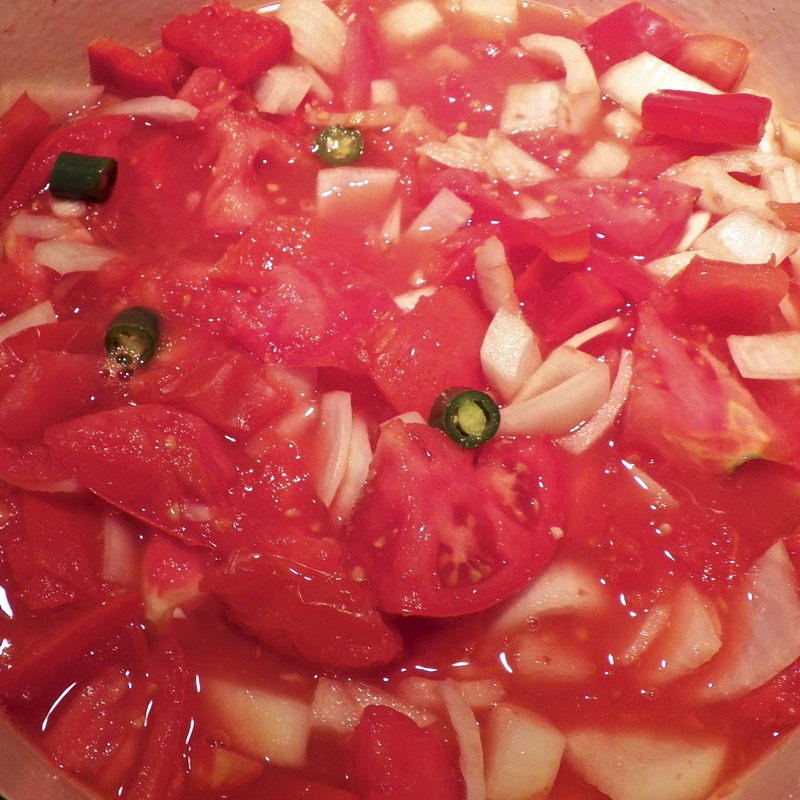 Place sugar, chiles, and tomatoes in a thick bottomed, non-reactive pot. Stir and allow to sit for 1/2 hour. Using medium heat, add the remaining ingredients, and bring to a boil, before reducing to a simmer. Stir often to prevent scorching. 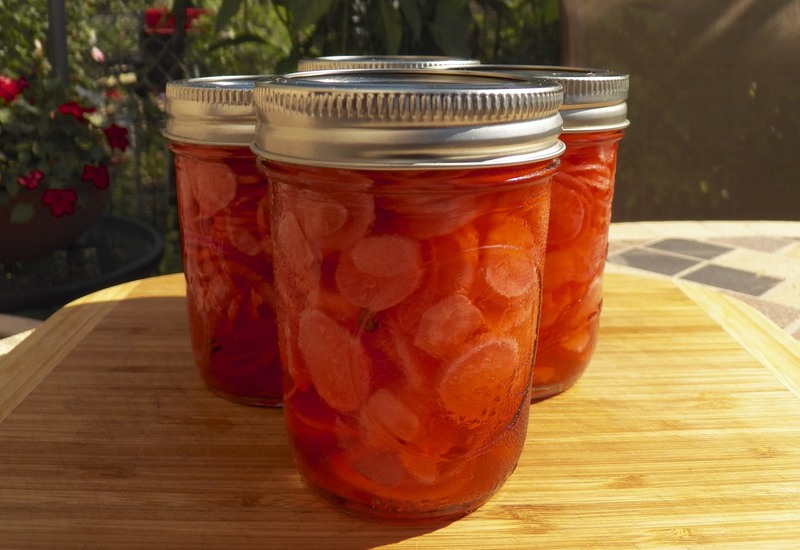 Once your tomatoes are jammin’, fill sterilized jars to 1/4 inch of the rim. Place the lid on each jar and process in a boiling water bath for 15 minutes. 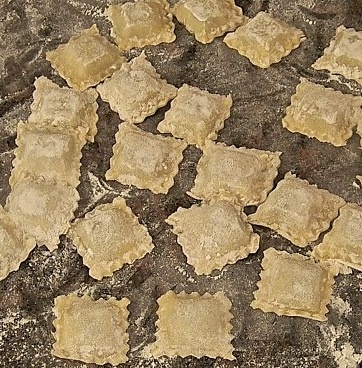 Remove from the boiling water, place on a towel lined baking sheet, and place them all in a draft-free area where they will remain undisturbed for at least 12 to 24 hours. Check to make sure each jar is properly sealed and store them in a cool, dark place. Those not sealed should be refrigerated and eaten within two weeks. When researching the amount of time required to process these jars in a hot water bath, I came across 3 different time requirements; 5, 10, and 15 minutes. Preferring to err on the side of caution, I processed my jam for 15 minutes in a boiling water bath. Although I peeled the tomatoes in the first batch, it was virtually impossible to peel the dozens of cherry tomatoes, so, I didn’t. I was surprised to find there was no detectable difference in texture between the two batches and I won’t be peeling tomatoes for jam in the future. After cooking for an hour or so, I used a potato masher to crush any of the cherry tomatoes that remained whole. This released their liquid into the pot and, I believe, shortened the cooking process. In the first batch, I used 3 green Thai chiles, removing both seeds and veins, thinking they would be too hot if used whole. Well, I could not detect them at all. In the second batch, I used one green Thai chile, leaving seeds and veins intact as I chopped it. It’s heat was barely detectable. I’ve yet to figure out what I’ll do next time but I’ve a feeling there’s one batch of very spicy tomato jam in my future. There are a few ways to test whether your jam will set. I use the plate test. While your jam is boiling on your stove top, place a dish in your freezer. 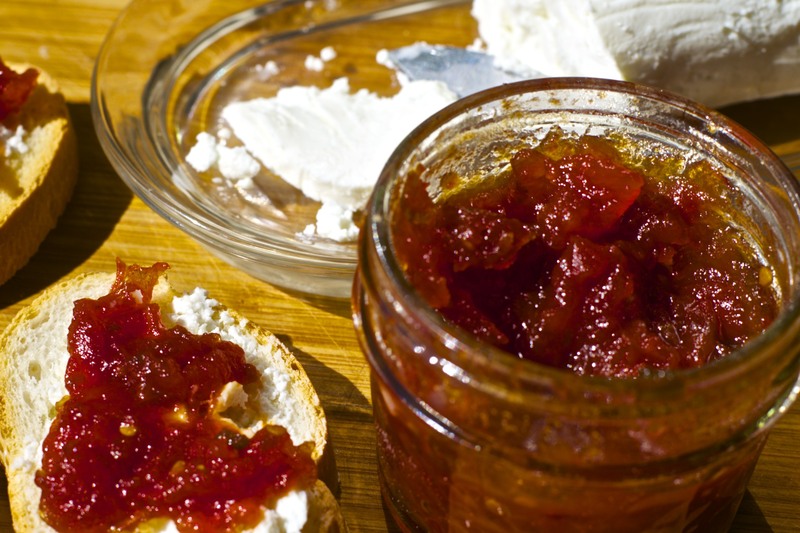 When you think your jam is ready, take about a half-teaspoon of jam and place it on the now chilled plate. Allow the jam to rest a few minutes before using another spoon or your fingertip to see if the jam has set or is still too runny. If the latter, continue to simmer the jam while returning the plate to the freezer to await the next test. 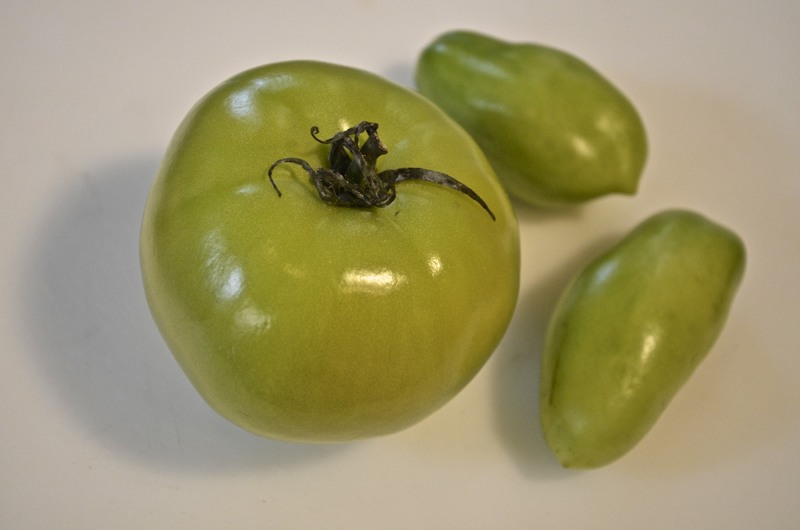 The cherry tomatoes that I used are an heirloom variety called “Mexican Midget”. 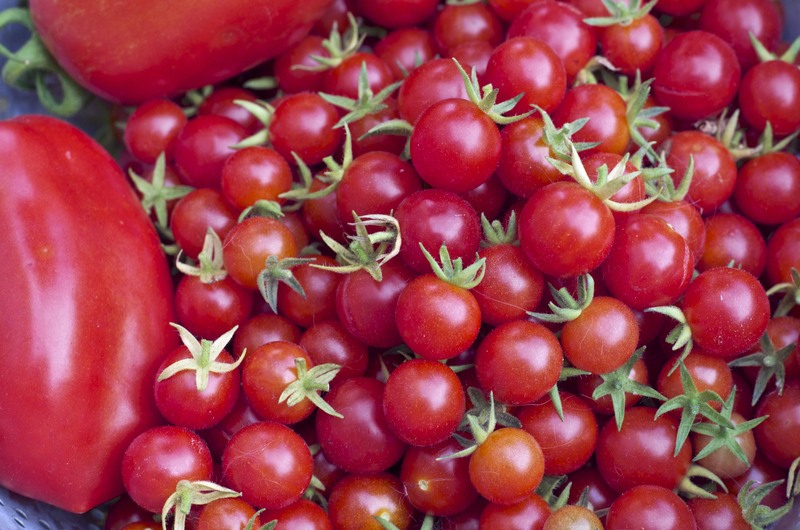 One plant will produce a great deal of fruit, though smaller than “normal” cherry or grape tomatoes. The largest of these tomatoes are no bigger than my thumbnail, with many as small as the nail of my little finger. 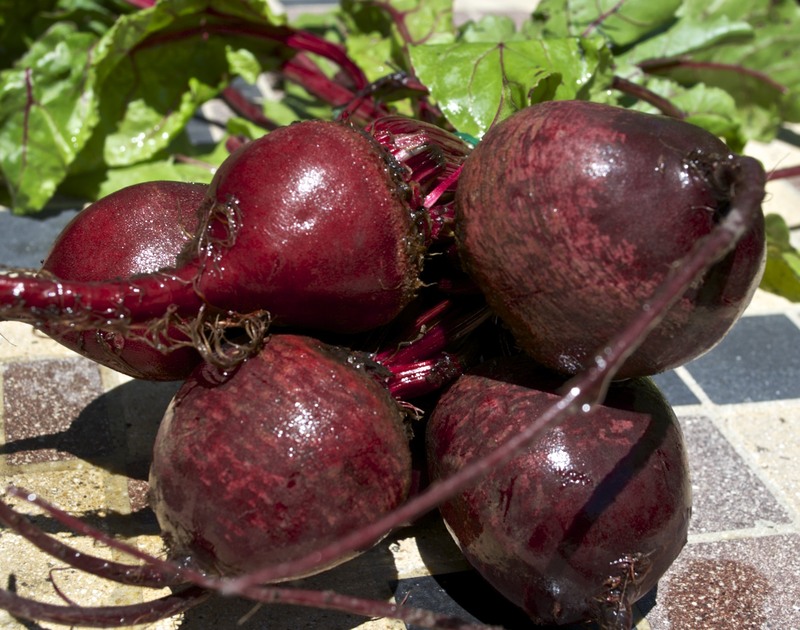 Up until I used them to make jam, I tossed a handful of them into each of my dinner salads — and still dozens remained on the plant. Since this is a jammin’ post, we might as well be consistent. 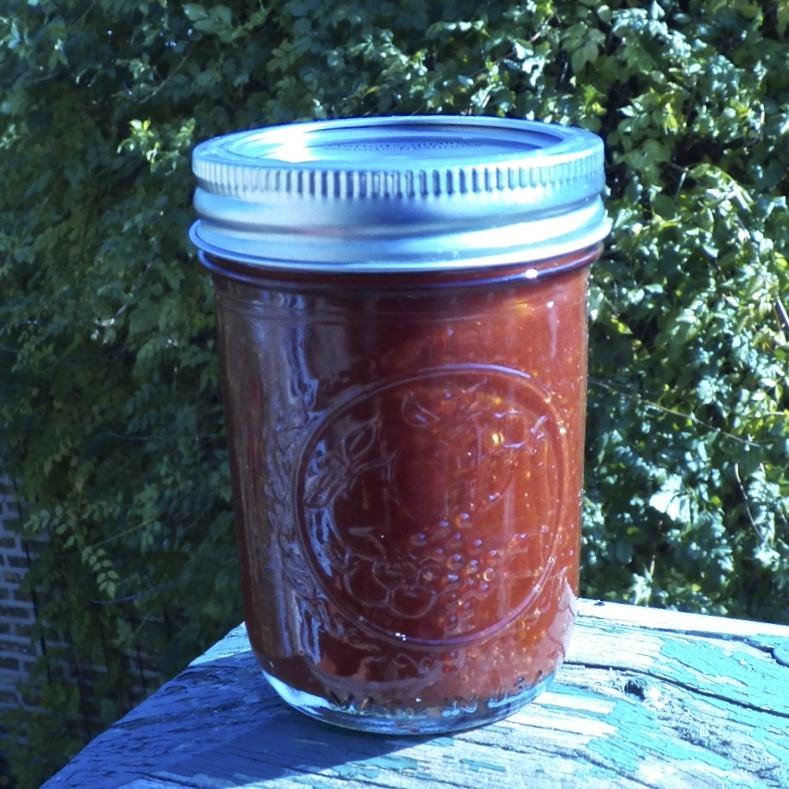 Today’s blast from the past is a recipe that I shared last year, Fig Preserves with Balsamic Vinegar and Black Pepper. Not only is this jam great when served with toast and, say, goat cheese, but it works beautifully when used to stuff a pork roast. WIth figs now filling our markets, this is one jam you won’t want to miss. Just click HERE for the details. Argh! “The best laid schemes o’ Mice an’ Men”. It’s happened again. I have a schedule for these posts. I really do. Today’s entry, for example, was to have been an instructional post detailing how to make Italian mozzarella. The Fates, however, intervened. In the days preceding my trip to Michigan, I failed twice to make the cheese. I thought I’d be able to try again once I returned home but soon there were peppers to pickle, figs to preserve, olives to cure, and a seemingly endless stream of posts to read and comments to write. So — and by stating my plans I’m taking a big risk with those pesky Fates — I decided to schedule Italian mozzarella for October 10th. Now, pushing mozzarella off into the future left me in a bind. I had no post for today. Earlier I mentioned I had figs to preserve. 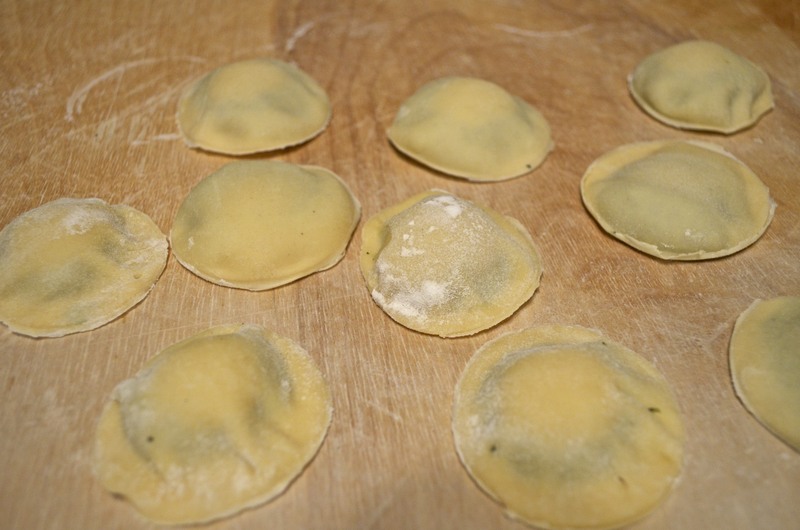 Well, that recipe suddenly became today’s post, meaning I had some writing to do. As you can see, I got it done but, as for the backlog of posts & comments, I’m still working on them. Sorry for the delay. 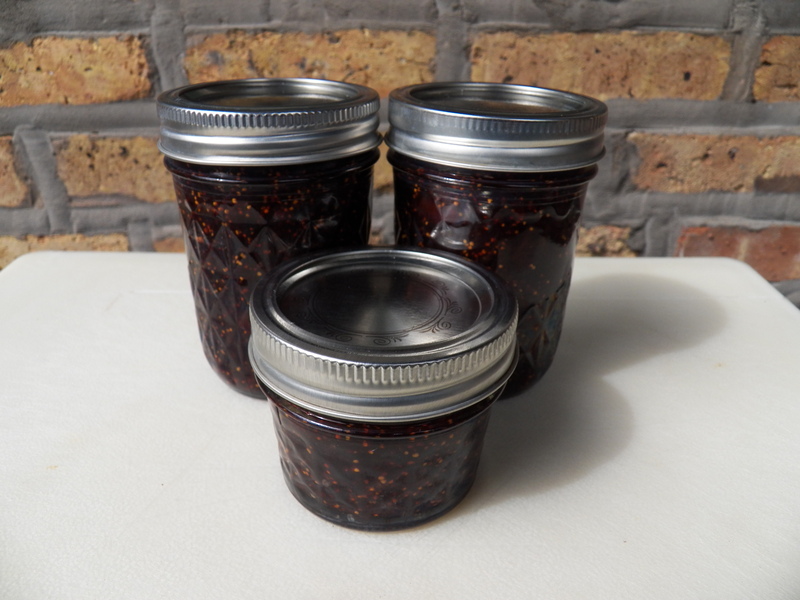 A few weeks ago, chaiselongue1 posted Jamming, an entry about making fig jam. (If you’re not familiar with this beautiful blog, olivesandartichokes, now is as good a time as any to check it out.) I thought that jam sounded delicious but that’s about as far as it went — until a market last week had crates of Mission figs for half the price I’d previously seen. 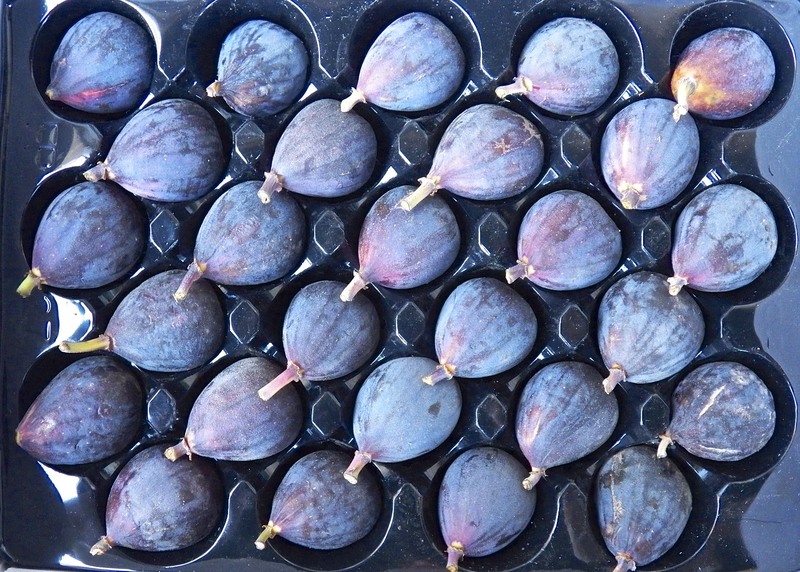 Next thing you know, I’ve got 2 crates (about 3 lbs) of figs in my cart. Once I got home, I checked the Jamming post again, as well as the Pick Your Own website, as I always do before I preserve anything. Once there, a sentence caught my eye. “If you like strawberry jam, you’ll love fig jam.” That got me to thinking. 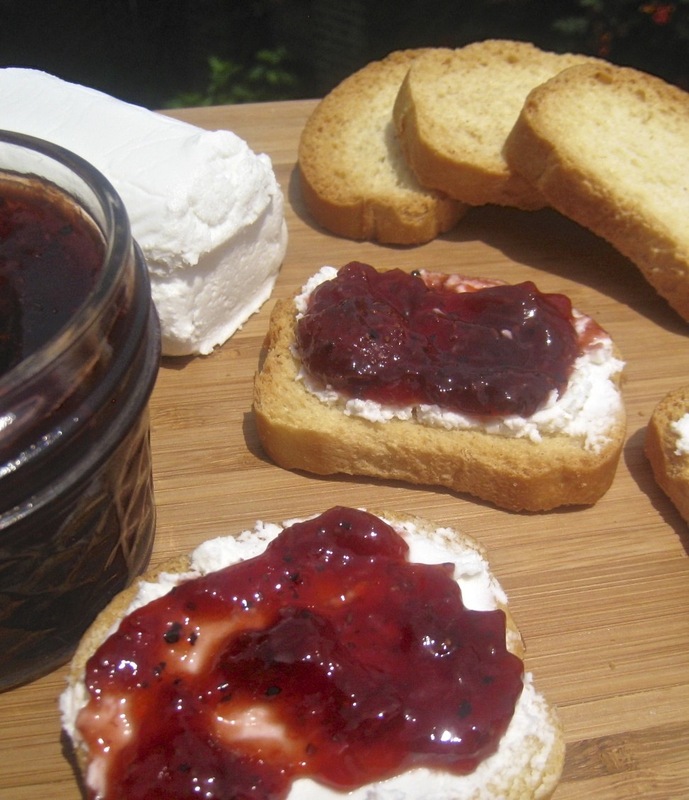 I went back to the recipe I’d shared for strawberry jam with balsamic vinegar (thanks, Sarah!) and decided to use it as a guide for these preserves. Sterilize the jars and wash the jar lids and rings in hot, soapy water. Place lids and rings in a deep bowl and pour near-boiling water over them. Start bringing to boil a large, deep canning kettle of water to be used for the canning process and a second, smaller pot of water to be used to replenish water that may boil away during the canning process. Trim stem and bottom of each fig before chopping. When finished, use a potato masher to smash them. Once a rolling boil has been achieved, place a small amount of the fig mixture on the now frozen plate. Once the cooked figs have returned to room temperature, check to see if it is jam-like. If too runny, continue cooking for 10 minutes and test again. When the right consistency is achieved, remove from heat and continue to the next step. With a large spoon, carefully skim the surface to remove any foam. Add the balsamic, black pepper, and lemon juice. Stir well to thoroughly combine. 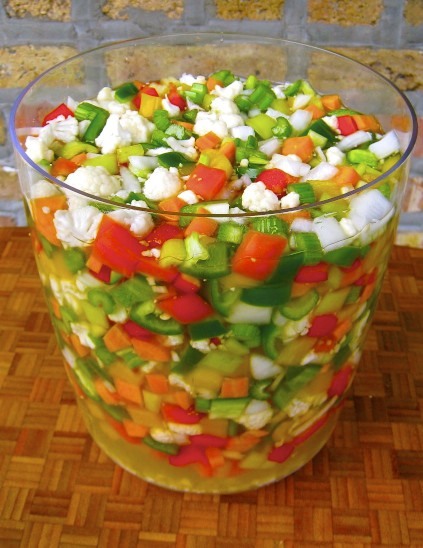 Using a funnel and large ladle, fill each jar to ¼ inch from the rim. Wipe the rim to make sure no jam has spilt, place a lid on each jar, and then the ring, tightening until “finger tight” but not as tight as you can make it. Act quickly, filling and capping all the jars. Jars placed directly on the kettle’s bottom might burst, so, a rack of some sort must be put into the canning kettle to cover the bottom. Many large pots have one, as do many pressure cookers. Keep each jar level as you place them, one by one, into the canning kettle filled with now boiling water. The jars should not touch each other, nor should they be allowed to tip over. Depending upon the size of the kettle and number of jars, you may need to work in batches. Once the jars are in the kettle, make sure that there is at least one inch of water over the top of the tallest jar(s). If not, add boiling water from the smaller pot mentioned in Step 2 of To Prepare. Cover the pot and begin timing when the water returns to the boil. The jars must be boiled, “processed”, for 5 to 10 minutes, depending upon the size of jar used. Meanwhile, place a baking sheet on a level surface and line it with a clean kitchen towel. Once the time has passed, carefully remove each jar and place it on to the towel-lined baking sheet. Leave about an inch separating the jars. Once all the jars have been processed and placed on the baking sheet, remove the baking sheet & jars to a place that is draft-free and where they will remain undisturbed for 24 hours. After 24 hours have passed, check each jar to insure it’s sealed and then store on a shelf in a cool, dark place, where it will stay fresh for months. 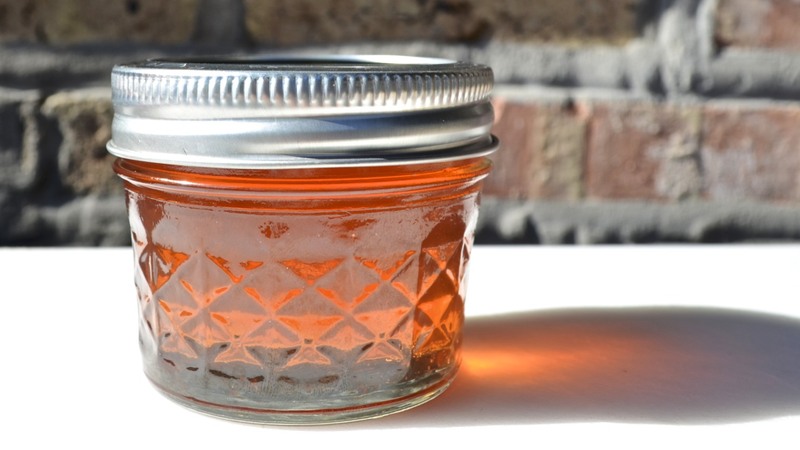 Once opened, the preserves should be refrigerated and fully used within a month. It’s that time of year again. Concord grape time, that is. In our farmers markets, groceries, and vegetable/fruit stands, the grapes are on full display. Although a sure sign of Summer’s end, they do mean that it’s time to start making some jelly — and I’ve got a few pounds of the blue beauties just waiting to be transformed. I’ll be following a recipe that I used last year. If you’re interested in doing the same or just want to check it out, you can do so by clicking HERE. Peaches in this area are just passing their peak season and the farmers markets are filled with them. 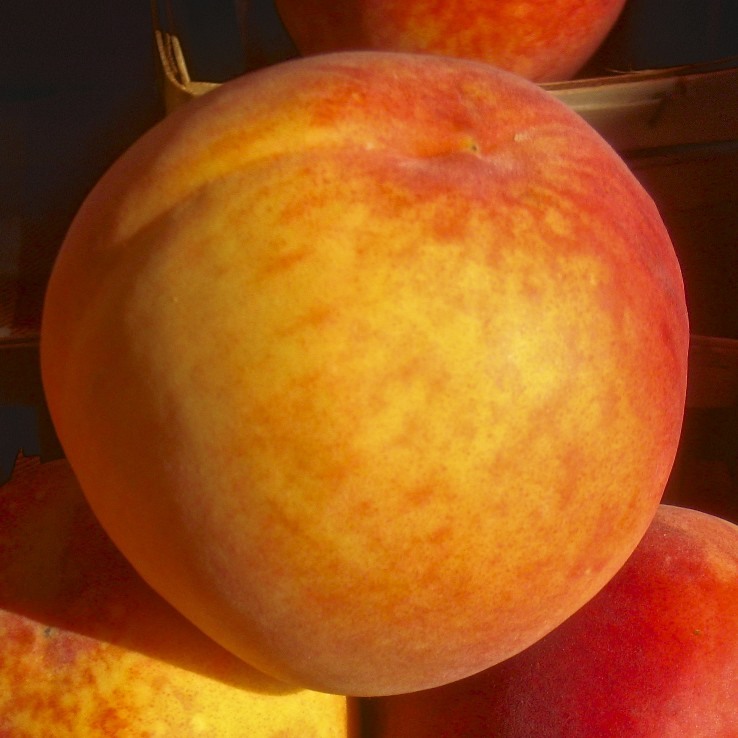 Over the next few weeks, peaches will disappear and the pears and apples will supplant them. For now, though, they seem to be calling to me, just as the tart cherries, blueberries, and strawberries did before them. So, I’ve answered their call and bought some each time I’ve gone to the market. Admittedly, the first purchases were eaten as-is. How could I not? After that, I made ice cream and posted a recipe in honor of Mom’s birthday last week. Having made a few quarts of peach ice cream, it was time to move on. After my last trip to the farmers market, I had what I thought was enough peaches to make a small-ish batch of peach jam — with a little balsamic vinegar. The recipe enclosed within the pectin packaging called for 4 cups of cleaned fruit. Incredibly, I somehow ended up with 7½ cups. I decided to use 6 cups here and to save the rest for a custard-based ice cream. (Recipe to come.) This recipe is very similar to the one used to make the strawberry jam, except I used white balsamic so that the peaches wouldn’t discolor; I used both lemon juice and zest; and, I didn’t add any pepper — maybe next time. Because I used so many more peaches than I had intended, I followed a tip from the Pick Your Own website. The author always adds an additional 20% of pectin than what the recipe calls for, just to ensure a good set. So, rather than add 49 g (1 envelope) I added 60 g to the peach mixture. My jam set perfectly although, next time, if I use 6 cups of peaches, I’ll increase the amount of white balsamic by another tablespoonful or two. 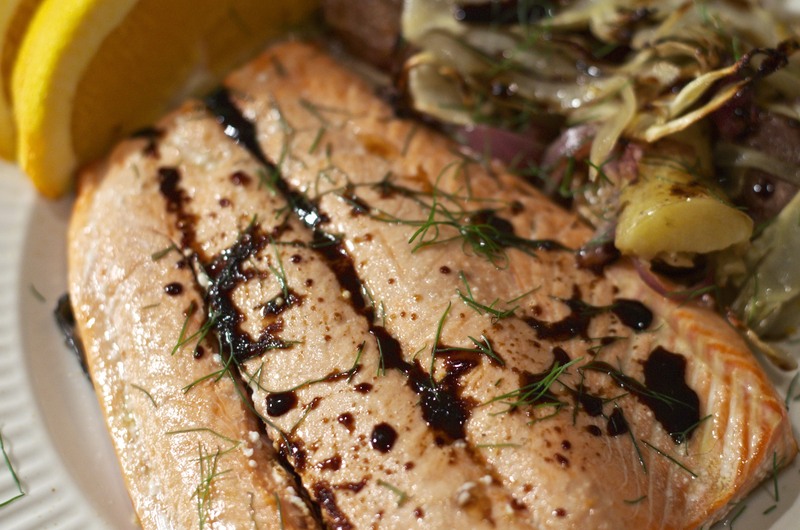 What if you’re not a balsamic lover? 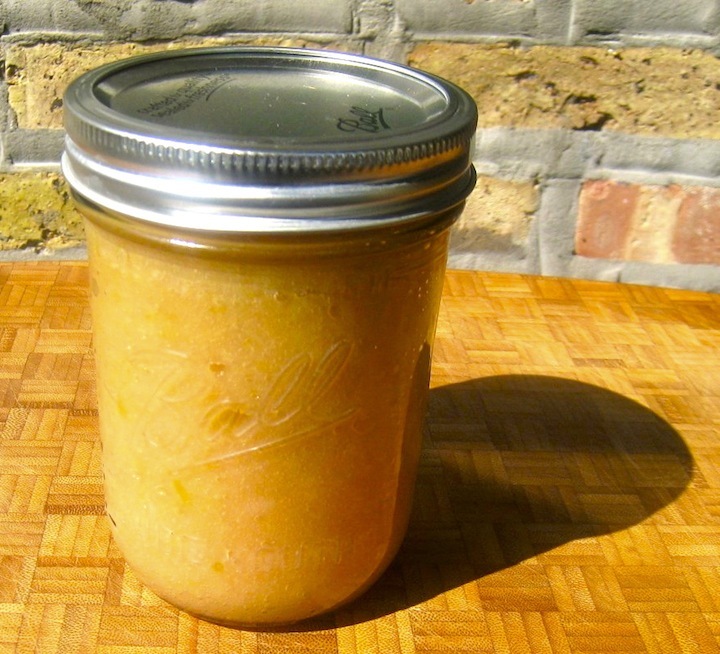 What if you just want to make some really good peach jam? 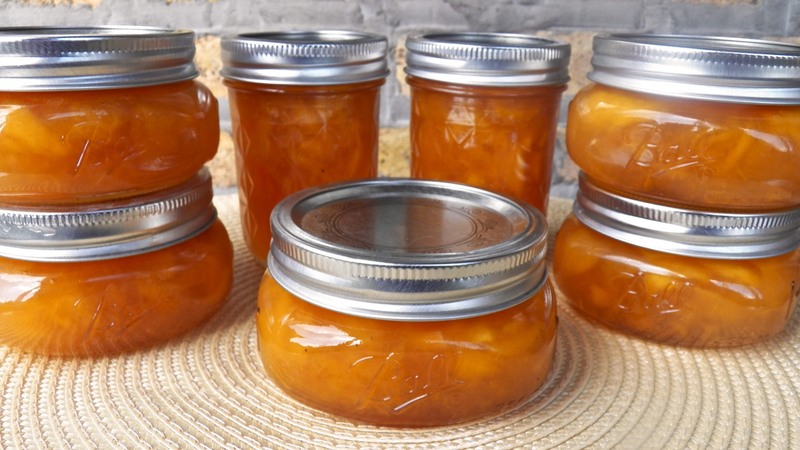 Well, then, waste no time and click this link to go to Barb’s Just a Smidgen blog, where you’ll be treated to a fantastic recipe for making peach jam, not to mention a thorough, step by step, description of the canning process. Sterilize the jars and wash the jar lids and bands in hot, soapy water. Place lids and bands in a deep bowl and pour near-boiling water over them. Mix the pectin with ¼ cup of the sugar. Set aside. Working in batches, add sliced/chopped peaches into a large bowl and use a potato masher to smash them as much as you like. I skipped this step; my slices were thin and needed no further handling. 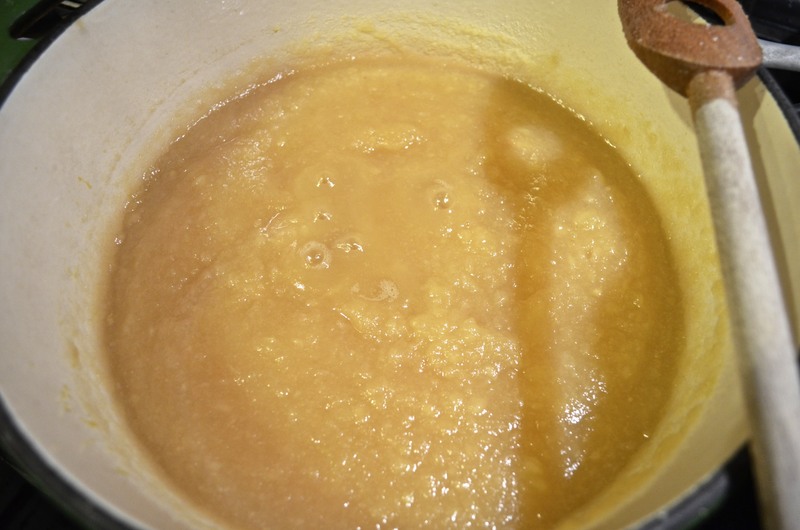 Place the peaches and the pectin-sugar mixture into a heavy-bottomed pot over a med-high heat. A Dutch oven works nicely. Add butter, if desired, to limit foam. 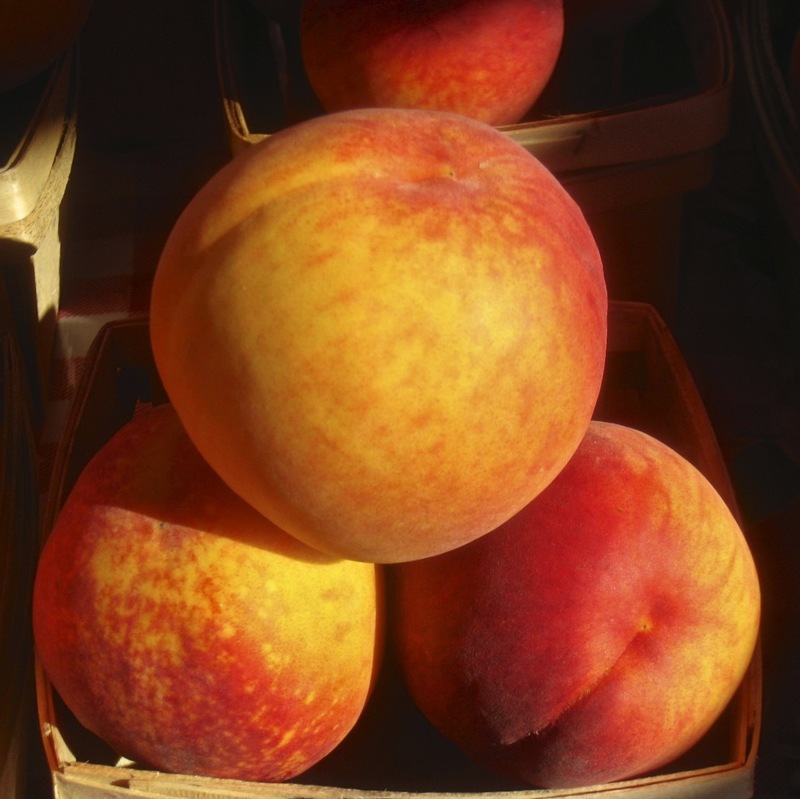 Stirring frequently, you are heating the peaches until a rolling boil is achieved at about 220˚F. A rolling boil is one that will not dissipate when the pot’s contents are stirred. Add the remaining sugar and stir well. Stir frequently while you wait for the pot to return to a rolling boil. Once a rolling boil has returned, keep stirring for exactly one minute before removing the pot from the heat. Add balsamic vinegar, lemon juice, and zest. Stir well to thoroughly combine. 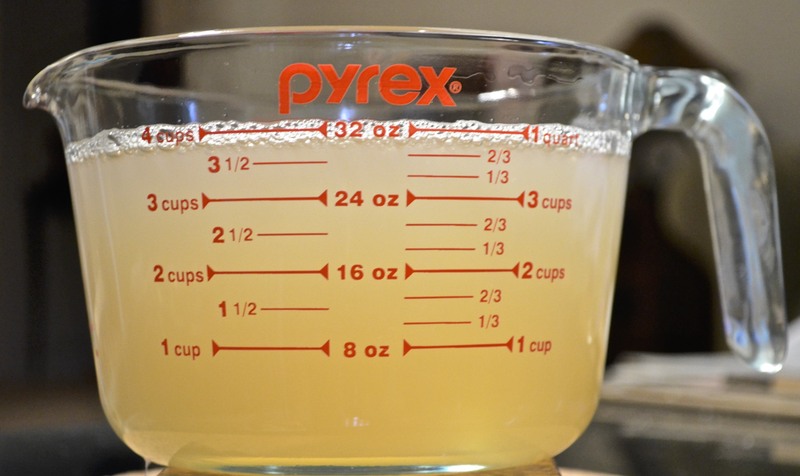 Using a funnel and large ladle, fill each jar to ¼ inch from the rim. Wipe the rim to make sure no jam has spilt, place a lid on each jar, and then the band, tightening until “finger tight” but not as tight as you can make it. Act quickly, filling and capping all the jars. Cover the pot and begin timing when the water returns to the boil. The jars must be boiled, “processed”, for 10 minutes. Once 10 minutes have passed, carefully remove each jar and place it on to the towel-lined baking sheet. Leave about an inch separating the jars. 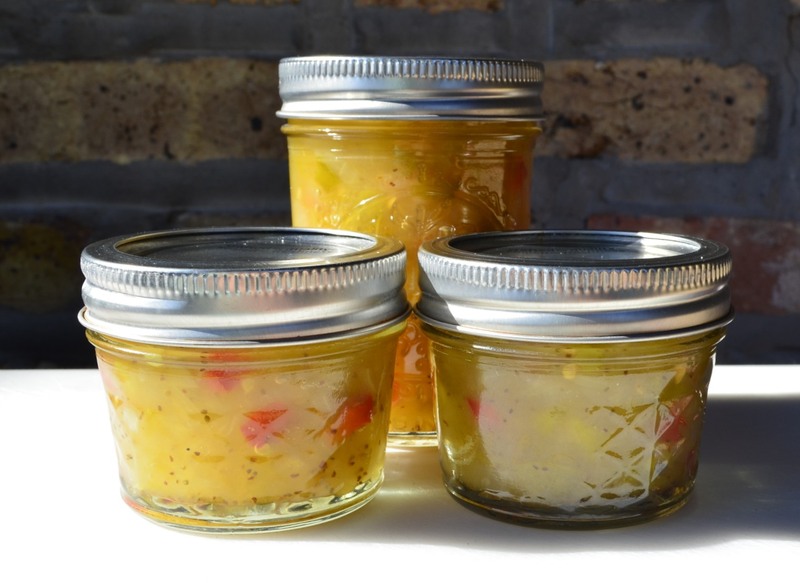 This time of year, our farmers markets are filled with fresh fruits and vegetables, and with Labor Day barbecues quickly approaching, there’s no better time to make a batch of Chicago-style giardiniera. 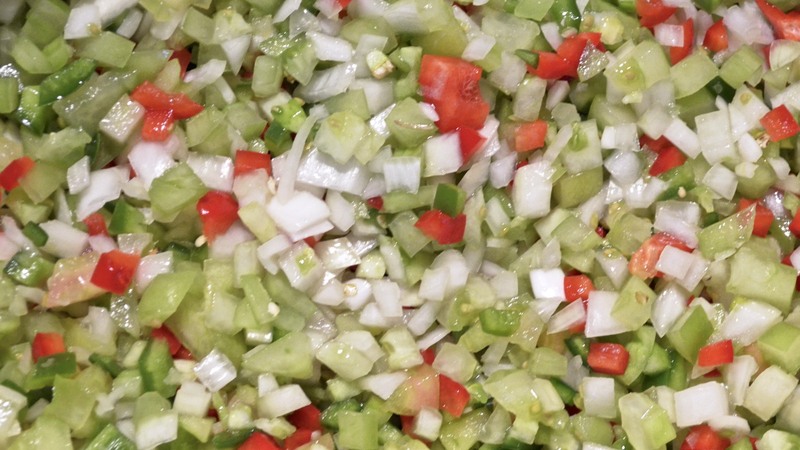 This colorful condiment is a great way to add some crunch, and a little heat, to your burgers, dogs, wurst, and sandwiches. 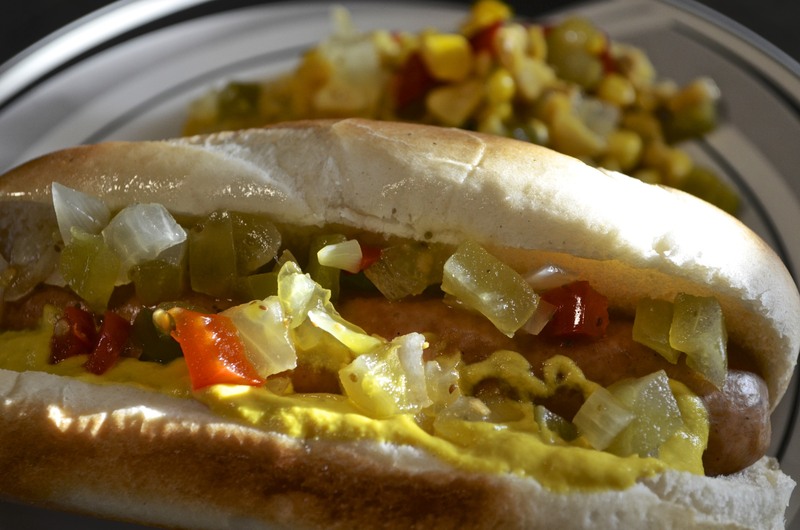 The recipe was shared last August and you can find it by clicking HERE. You may recall, two weeks ago my mascarpone post contained three recipes, one of which paired strawberries with balsamic vinegar. What some of you may not know is that the day before, my blogging buddy, Sarah, whose blog Sarah’s Place, is one worth checking out, had a “relaxing” day that included starting and making a great deal of progress on a knitting project; preparing strawberry balsamic and black pepper jam from a recipe that she found on another worthwhile blog, Sydney’s Kitchen; and baking a rosemary-herbed focaccia studded with cherries. Did you notice the part about the jam? It sure did catch my eye, particularly arriving when it did, just before my own post featuring those same flavors. Suddenly, I was thinking about making jam. Well, coincidentally, that Friday, a 2nd blogging friend, Michael, whose blog Oishi is another that I enjoy, posted a salad recipe featuring — you guessed it — strawberries with balsamic … and this time bleu cheese, too. It was then that I decided to make jam and, as I wrote to Michael, I would buy enough berries to make his salad, too. The very next morning at the Evanston farmers market, once Max had his much-anticipated rendezvous with Debra, the crossing guard, I found myself standing before 3 long tables covered with quarts of Michigan strawberries, over which hung a giant sign, “Last Chance.” Whatever doubts I may have had were quickly vanquished. I bought 3 quarts and moved on to the Egg Ladies’ stall. You see, the original recipe would make only 1 jar of jam and it wasn’t processed, meaning it had to be refrigerated and used within 3 to 4 weeks. Well, I need to make enough jam to give jars to an entire team of tasters, as well as my Zia, and this recipe just wouldn’t do. 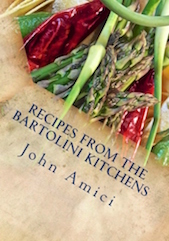 So, I went looking for a canning recipe that remained true to the original, while making enough for each of my devoted tasters. Luckily, I found two. The first recipe, from Canadian Living Magazine, gave me canning instructions but the amount of balsamic required was quite a bit less than the amount used in the original. Not being an experienced canner, I didn’t know whether increasing the amount of balsamic would ruin the “set” of my jam. 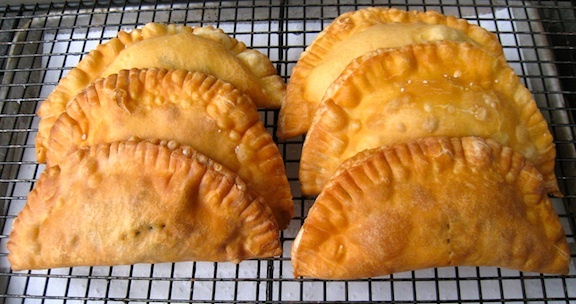 I had no choice, therefore, but to look for another recipe — and I and found one on Epicurious.com. With a balsamic amount proportional to that used in the original, a couple of commenters stated that they canned it without any problem. Eureka! Now armed with this new-found knowledge, I braved the heat and set pots of water to boil, as I cleaned and hulled my strawberries. So, to be fair, I’ll credit Sarah’s Place, Sydney’s Kitchen, Epicurious.com, and Canada for the inspiration for today’s recipe. Working in batches, add sliced berries into a large bowl and use a potato masher to smash them. Continue until all are equally smooshed. 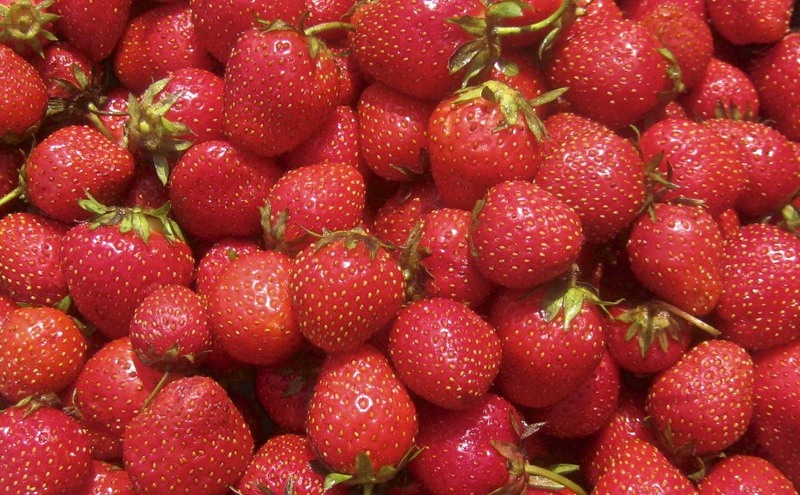 Place the strawberries and the pectin-sugar mixture into a heavy-bottomed pot over a med-high heat. A Dutch oven works nicely. Add butter, if desired, to limit foam. 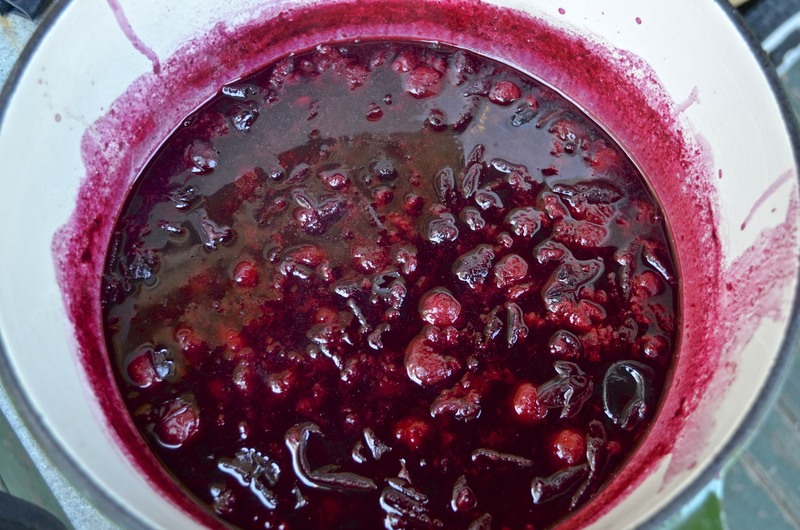 Stirring frequently, you are heating the berries until a rolling boil is achieved at about 220˚F. A rolling boil is one that will not dissipate when the pot’s contents are stirred. Add the remaining sugar and stir well. Stir frequently while you wait for the pot to return to a roiling boil. Add balsamic vinegar and pepper. Stir well to thoroughly combine. According to several commenters on the Epicurious website, once canned, it is best to let the jam sit for a week before sampling it. The flavors blend and the pepper becomes more pronounced. 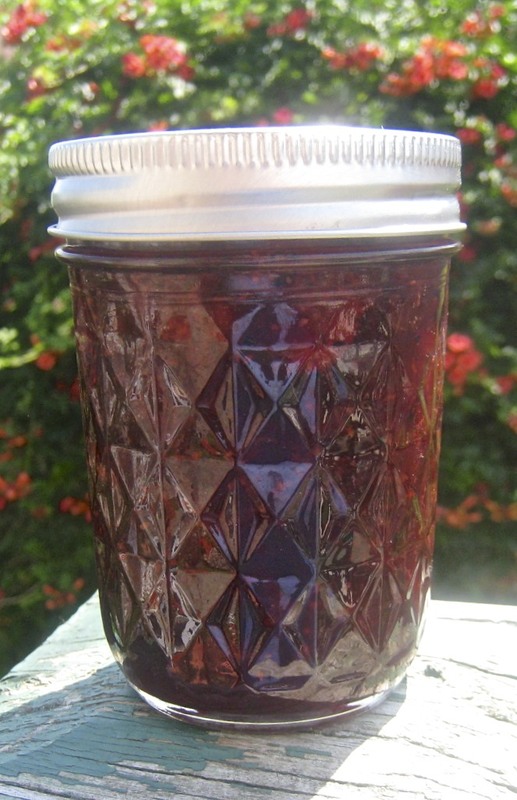 Once opened, the jam should be refrigerated and fully used within a month. I did make Michael’s salad and it was every bit as good as I had hoped. Don’t sit under that apple tree. Make apple sauce! I love this time of the year. Here in Chicago, Winter’s relentless, Spring’s nonexistent, Summer’s hot & humid, but Fall, beautiful, wonderful Fall is our reward for putting up with the rest of the year’s weather. The days are warm, the nights cool, the lakefront a thing of beauty and the Park, which borders the Lake for pretty much the full breadth of the City, gradually transforms from lush green to a multi-colored patchwork. As nice as that all sounds and is, truthfully, there’s but one thing missing and, surprisingly, it has little to do with my adoptive home but everything to do with the time of year. It’s apples. I love apples. Cook ’em, bake ’em, turn ’em into sauce. Give me a pie, a tart, a crisp, a cobbler. How about a muffin? A piece of cake? A slice of bread? A stack of flapjacks? Or, if all else fails, just give one to me raw. Believe me, you cannot go wrong offering me apples in any way, shape, or form. So, for years, when Fall rolled around, I set about making pies and cobblers, with an occasional loaf of bread or a baked apple thrown in for good measure. This all changed 2 Summers ago when I bought my Roma Sauce Maker. (Do you hear a harp? I always hear a harp when I mention that strainer.) 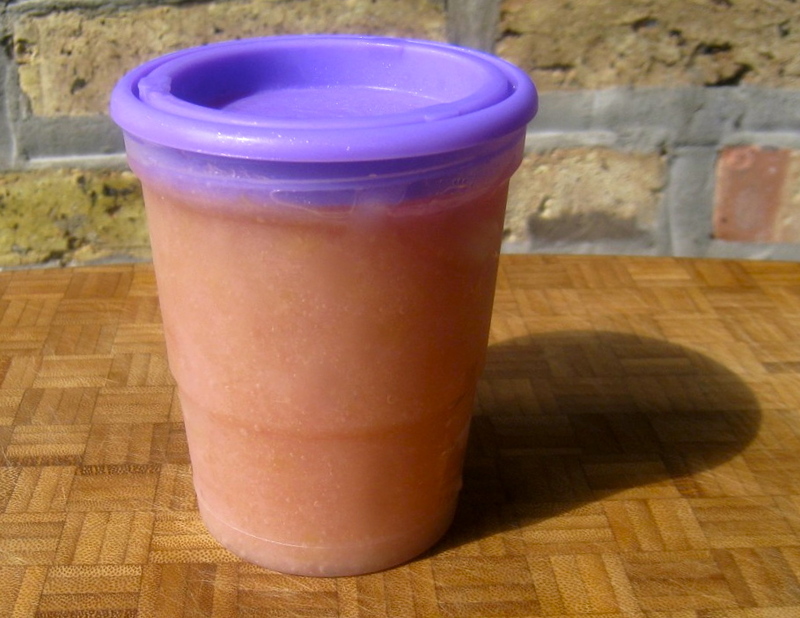 I bought it to process my tomatoes before freezing but I quickly learned that it was good for making apple sauce. Well, that was a game changer around this place. In prior posts, I’ve mentioned the two boys that live above me with their Mom. The oldest, like most kids, loves sweets of any kind. The youngest is his polar opposite and doesn’t like sweets. Period. This poses a problem for me. I’d love to bring them ice cream, cookies, or whatever it is I’m making in the kitchen but I shy away from it because I don’t want the little guy to feel left out. That, however, was before my Roma Sauce Maker came home. (C’mon! You had to have heard that!) The Li’l Guy, you see, loves apple sauce. So, this time of year, he gets all the apple sauce he wants. That was, until very recently. Now, I CAN, which means the apple sauce I make today can, and will, be given to him next May when I give his brother some cookies, or, in July when I make ice cream for the house. And, best of all, he can still have plenty of apple sauce now, too! There really is an upside to this canning business. Who knew! Now, as for the sauce, I am by no means an expert but I have had some pretty good luck with it. To begin, I never use anything but apples, a few ounces of organic apple juice, and a pinch of salt. That’s it, no sugar whatsoever and, for that matter, no cinnamon either. I use about 4 kinds of apples, all sweet, for every batch of sauce. 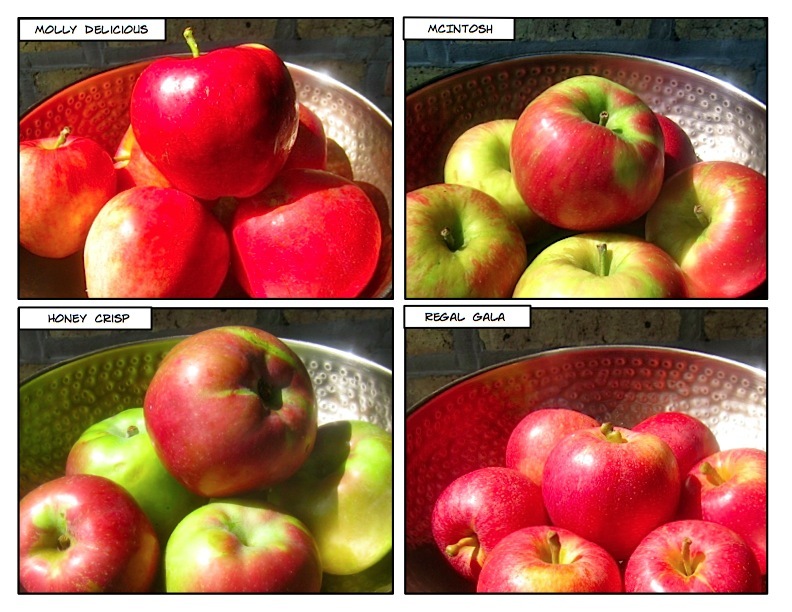 This week, as shown, I used Molly Delicious, McIntosh, Honey Crisp, and Regal Gala. Because they’re so small, I selected 7 Galas and 6 of each of the other varieties; their total weight being 10 and a half pounds (4.8 kg). Although there’s no need to core or peel the apples when you use a strainer or food mill, you still need to cut up the apples. So, I used my corer/slicer and, in about 10 minutes, had all of these in the pot and ready to go. Since I don’t add sugar or cinnamon to my apple sauce, there really isn’t a recipe to share. Instead, I’ll give you the steps that I follow and, as you’ll soon find out, making apple sauce isn’t at all difficult. First off, select apples known for their sweetness — i.e., Gala, Honey Crisp, McIntosh, Pink Lady, Fuji, Delicious, Macoun, and Golden Delicious, to name a few. Begin by washing all the fruit and, if you have a strainer or food mill, cut the apples into equal-sized slices or chunks. If no strainer, peel and core the apples before chopping the apples. Place the apple pieces into a heavy bottomed sauce pan over medium heat. Add 4 to 6 oz apple juice and simmer, stirring frequently. You want the apple slices to be soft when finished. This could take anywhere from 30 to 60 minutes, depending upon your stove, the pot, the amount of apples, and whether you’ve offended the gods that morning. 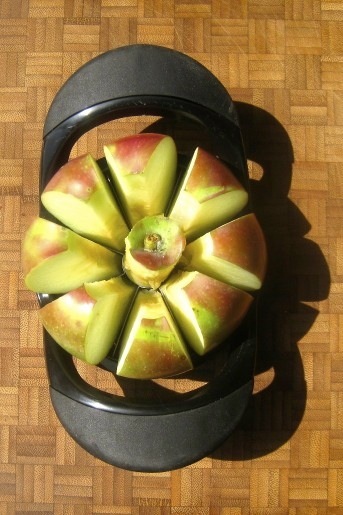 Once soft, pass the apples through your food strainer or food mill, separating the peel, core, and seeds from the pulp. 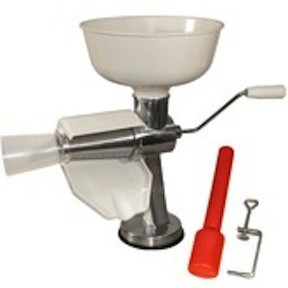 If you haven’t a strainer or food mill, once the apples are soft enough, you can mash them with a potato masher or force the pulp through a sieve. No matter which method you use, place the resultant pulp into a sauce pan. This is when I season it with a pinch of salt. You may wish to add sugar or cinnamon, to taste. If you’ve chosen your apples carefully, however, I think you’ll be surprised to learn just how sweet it is — and how totally unnecessary the sugar is. At this point, you can place it in your fridge where it will last about a week; cool it and freeze it; or can it. 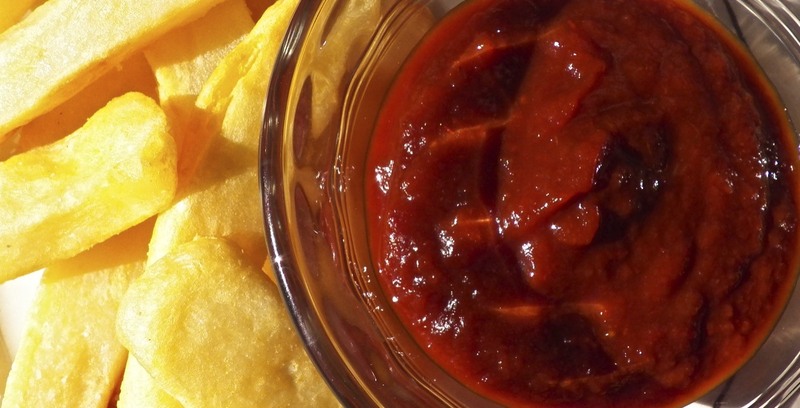 If you chose to can it, according to the Pick Your Own website, you will need to re-heat the sauce; use clean, sterile jars that are still hot; use sterile tops and lids; and process in a boiling water bath for 15 minutes if using pint containers or 20 minutes if using quarts. 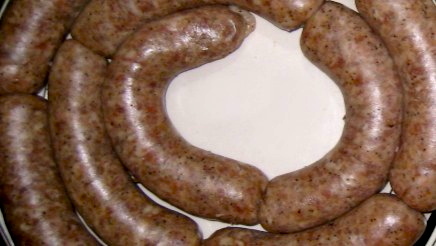 Once removed from the boiling bath, place on a towel-covered baking sheet and place in a spot away from drafts where they will remain undisturbed for 12 to 24 hours. My 10 and a half pounds of apples resulted in 6 pints of apple sauce. I canned 3 pints and froze the remainder in 6 single cup-sized containers. He doesn’t know it yet but there’s going to be one happy little boy living above me. OK. One last time. Roma Sauce Maker! All right, this time I agree with you. I couldn’t hear the harp because the fanfare was blaring. You did hear the fanfare, right? Right?